It also got a play on Mark Radcliffe’s show on BBC Radio 2 last night, and Mark commented that it’ll be out as a single in the first week of Sept. Strange thing is that Rough Trade Holland informed us this week that for the time being there will be no new single. There had been talk about Snow In Sun as being the new single but it had been postponed. Hurrah!! I should wait to hear it before I declare it the best thing since sliced (white) bread but how can you go wrong with a gorgeous melody like that? I wonder if it’s also in the promo. By the looks of the photo it doesn’t. Have to wait for the mailman. No it doesn’t Ernst, sadly…I got a copy of the same promo a couple of weeks ago and it’s not on there, although I’m keen to hear what might be one of the most emotional songs Green has recorded. It’s certainly a show stopper in the live set. 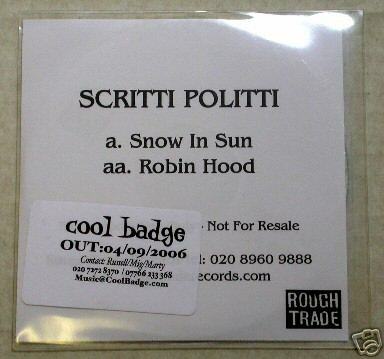 So are Snow in Sun and Robin Hood exactly as on the album, Peter? Of course I wouldn’t expect anything radically different but did wonder if they might ditch the bit tacked onto the end of the former. But Richard, that’s the best bit!! I’m indifferent to it really, just seems superfluous. I was hoping it might be left out so I can burn my own personally tailored version of WBBB, which also involves replacing ‘After Six’ with ‘Am I Right In Thinking’! Nah Richard – exactly the same versions, at least on this promo.